Tofu and tempeh has always been my favorite foods since I was a kid, It is something related to my home country Indonesia, we can find tofu and tempeh easily in traditional market and It's cheaper too than any other protein foods. This time I created simple recipe with soy puffs / fried tofu, This soy puffs in the package is ready to eat, great use for soup,stir fry or be creative with it. I made this simple appetizer with diced cucumber, carrot and basil and serve with peanut sauce on top. 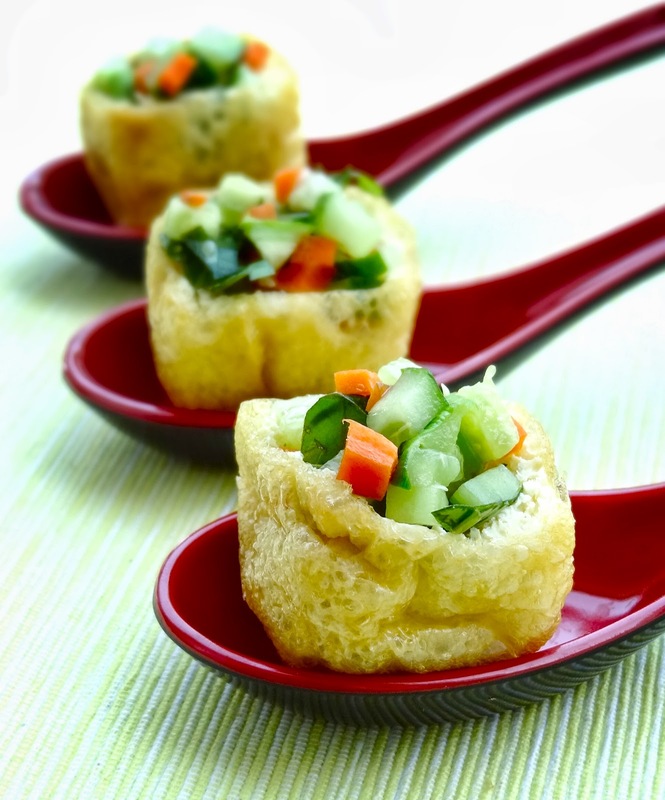 It's like very small portion of tofu salad,great idea for healthy appetizer. - peanut sauce/soy sauce or any Asian spicy sauce. 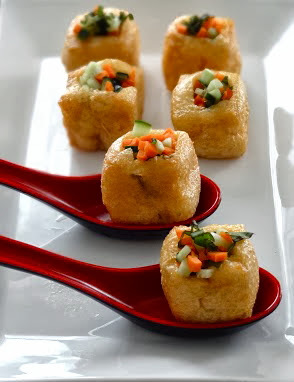 ( cut the soy puffs really thin,to make a pocket scoop with a teaspoon just a little bit,you can add them to the filling mixture if you like or just fill with diced carot,cucumber and basil, ready to served with peanut sauce,soy sauce,sweet and sour sauce or any sauce you like. Fabulous ides Man. The stuffing inside the puffs and kuah kacang are so good together. Compared to white tofu, I enjoy the puffs better and of course, tempeh is another of my fav. preety good savoury bites Ridwan!